In a previous career, I spent several years and extreme amounts of effort studying and practicing as a herbalist. I enjoyed herbalism immensely, and if it payed the bills, I would probably still be doing it. With this background in mind, I was charmed to come across our latest board game. ‘Wildcraft‘ arrived earlier this week. We have had to play several games a day since opening the box. Basically it is a race game. The premise is that you need to get to the huckleberry patch at the top of the mountain, pick lots of berries, and make it back to grandma’s house before nightfall. There are a few things which set it apart. In terms of game mechanics, it is a cooperative game. You either win or lose as a group, not individually. There are very few games around which work like this. I think it is a nice touch. The game takes this idea as far as having ‘cooperation cards’ which you use to help other players who are moving too slowly or struggling with the various challenges the game presents. You don’t even have to have all the players make it to the top of the mountain. As long as someone gets there an enough berries are picked, it doesn’t matter who does it. The cooperative elements of the game means it is actually very difficult to lose. Winning or losing does not really matter here though, because that is not where the joy of the game comes from. The main attraction is in the story of the various mishaps which occur along the path, and being able to get hold of the right herbs for each given situation. If you want to, there is an actual story which goes with the game that you can download and read as you go. I don’t know what it says. The boys have so much fun playing without it that whenever I make the offer to print it out, they will not let me. It is a highly visual game. Cards are designed so that even pre literate kids can very quickly learn what the different herbs are, and when to use them. In real life, many medicinal herbs are fairly scrappy plants which are often ignored, or treated as weeds. Once you know what to look for, it is not uncommon to find a few kicking around most gardens. We took the deck of herb cards and went for a wander around the back yard. Mint has overtaken one of our garden beds, and we also found some yarrow which has survived some fairly serious mistreatment. 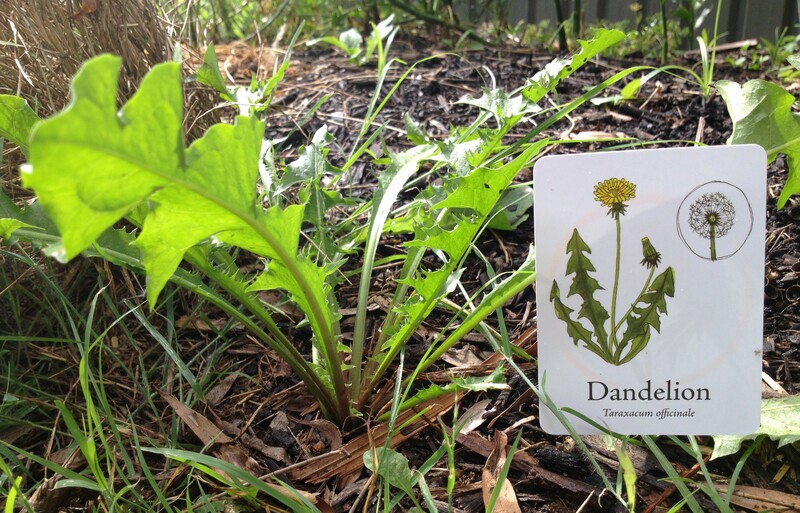 A dandelion seed had blown onto another garden bed and grown into a nice healthy looking plant. 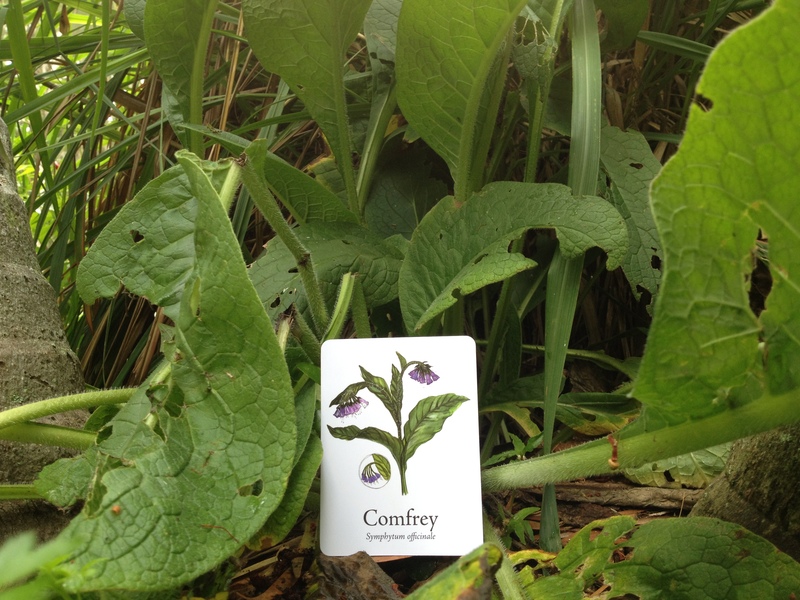 There was a patch of comfrey tucked under some palm trees. Although we could not find any, plaintain and chickweed often grow in damp corners of our yard. Yellow dock also commonly makes an appearance in neglected drainage lines around the place. Calendula, chamomile and coltsfoot have all been in our garden at some time or another, but we do not have any at the moment. Not listed on the cards, but still good to have around, we also came across lavender, lemongrass, rosemary, thyme, chilli, aloe vera, ginger and tumeric. Not a bad collection considering how little attention the yard manages to get. 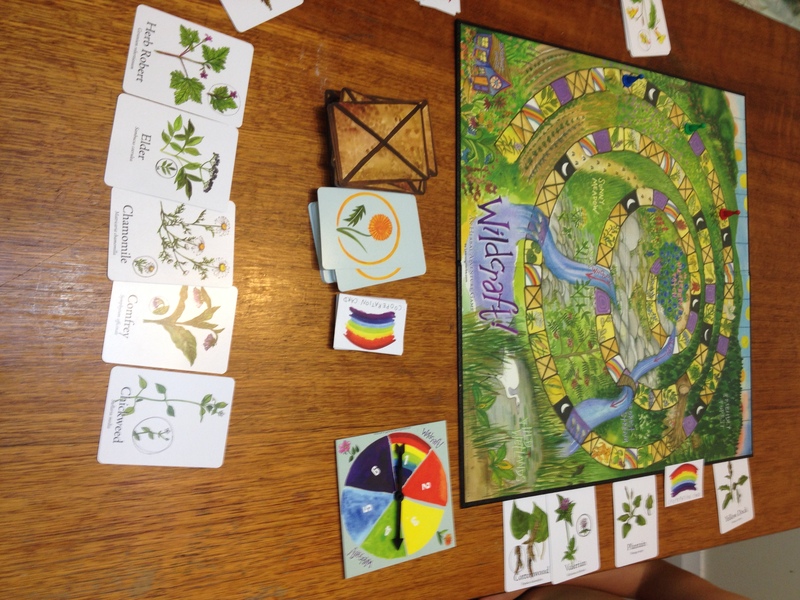 This entry was posted in Nature, Science and tagged bloke, board game, herb, homeschool, nature, play, science, wildcraft. Bookmark the permalink. Wildcraft is great! We have two friends with the game and the kids always like to get together and play 🙂 I love it’s co-operative nature as well, and it’s neat that we can all learn more about what is around us and the ways in which they can be used. It surprised me just how quickly the kids picked up what the herbs were, and what they could be used for. That looks like a fantastic game. I’ll have to keep it in mind. I’ve never heard of this game before but it looks fantastic! Thanks for sharing. My husband grew up on a farm and one of his primary jobs was running a baler in the hay fields. I’m always amazed how much information he is able to share with our boys when we walk through a meadow. Sounds like a fun game and a nice way to spark interest in learning about plants too many people overlook. I think it is great that your husband can teach about the details of meadows. Both on maps and in the imagination, they are so often the empty spaces to be passed through, rather than something of interest in their own right.